Posted in Misc and tagged Classic Parking at 4:40 pm on September 23, 2014 by Broadsheet. Looks good to me and also that car is v. cool. Looks good to you? 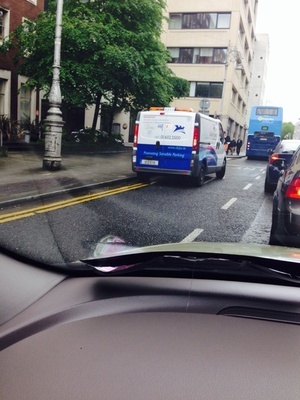 He/she is parked in a bus lane. Are some bus lanes only restricted to buses at certain hours of the day? It’s not a bus lane it’s a bus stop! Look at the shading on the part of the road that says “Bus”. It’s a wine colour. This extends ahead of the Merc until the photo is cut off (it’s a bus lane). No. It’s a bus stop. Seriously? a dented old merc.Goes to show what i know about cool. It’s not old enough to be a cool Merc. And that generation was particularly boring. didnt notice the parked car but did notice those mini sack things?? Ranelagh faux crusty urban garden stuff? 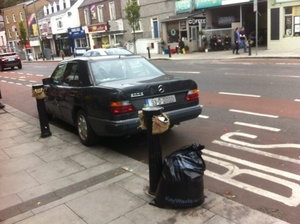 Ranelagh “greening” as parts of the Arts Week. It’s pathetic. Horrible looking yokes aren’t they? The plants in them look dead mostly, I personally think they look scruffy. Why is it always Beemers/Mercs? I acknowledge that I’m more likely to notice “f*** you world” parking when it’s a Beemer/Merc, but this cannot account for all of it. Others agree that this happens more often when it’s one of these cars? Maybe because the majority of guys who drive beemers are grade A dickheads who think the rules don’t apply to them. As for the merc drivers, could it be that they’re old and half blind? Those fancy coffee bag planters were there last Saturday Week. I must admit to been stunned that its taken 10 days from when I spotted thrm for them to be presented here. That’s predictive text for ya.